Hey there, Welcome back! This is my second post for the day. Here is my first post. Today is day #1 sneak peek of Taylored Expressions June release. 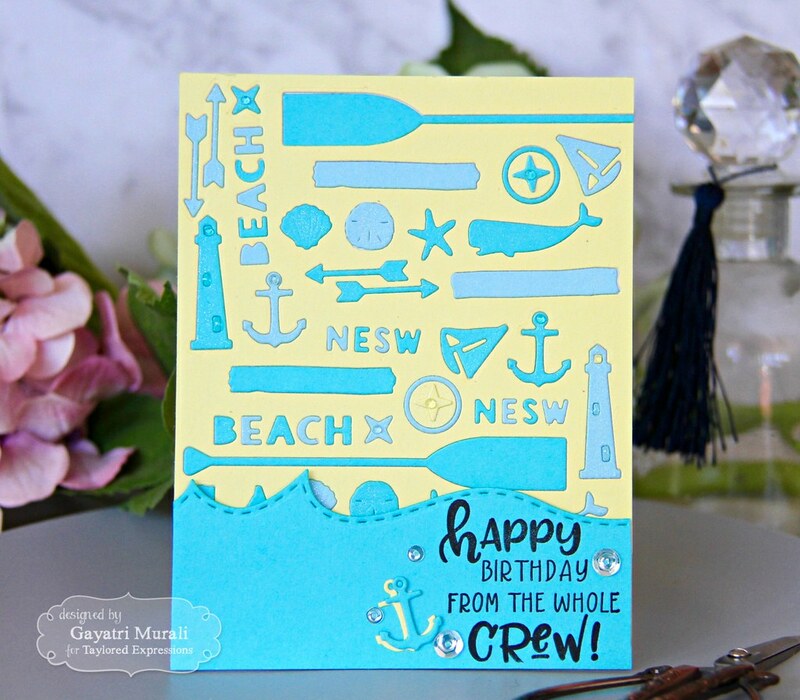 This month’s release is jam packed with nautical and summer themed goodies. I am showcasing two new products today. The first one is called Little Bits: Helm. 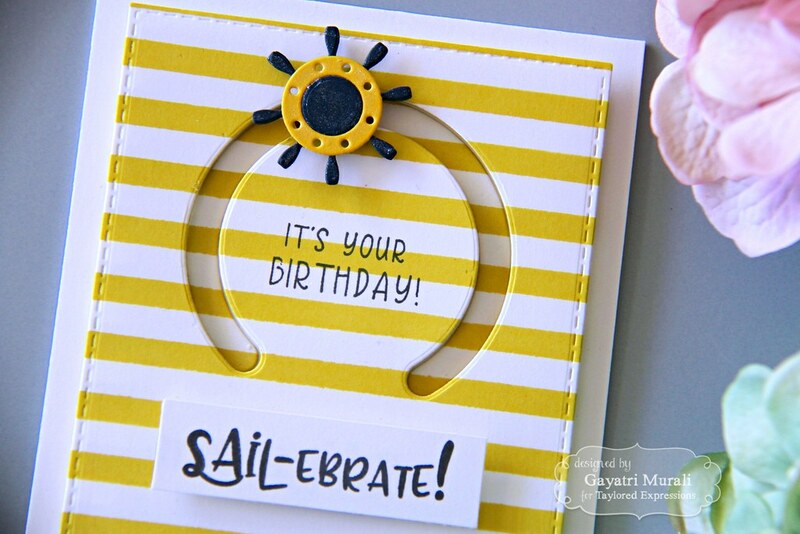 This die is one of a few nautical themed dies in this release. I combined this die with On the Track: Basics die to make a fun interactive card. I also used the new background stamp called Striped. 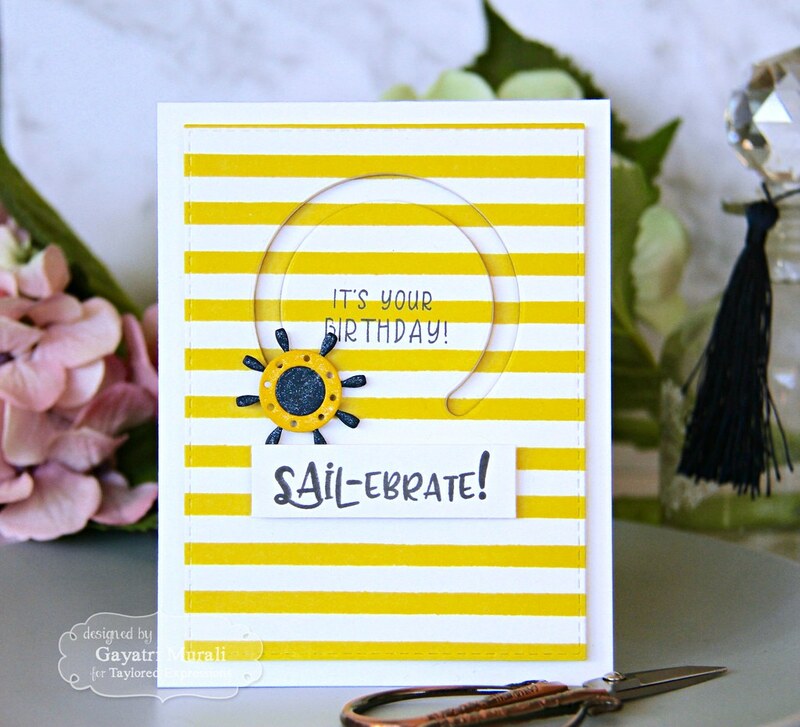 I used Lemon Meringue TE dye ink to stamp the striped background. I die cut the background panel using the largest of the Stitched Rectangle Stacklet die. Then I ran the circular On the Right Track Basics die to die cut the track element on the card. The helm die cut is cut out of Blue Corn and Lemon Meringue cardstock and assembled. I used a penny to make my slider for the helm to slide on the circular track. But Taylored Expressions also have sliders available. I used MISTI to stamped the sentiment on the centre of the circular track and the bigger sentiment on a strip of white cardstock, trimmed and adhered using foam adhesives. To add interest I brushed shimmer on the helm using wink of stella clear shimmer pen. The second new product I am showcasing today is called Sitting Pretty: Nautical Accessories. 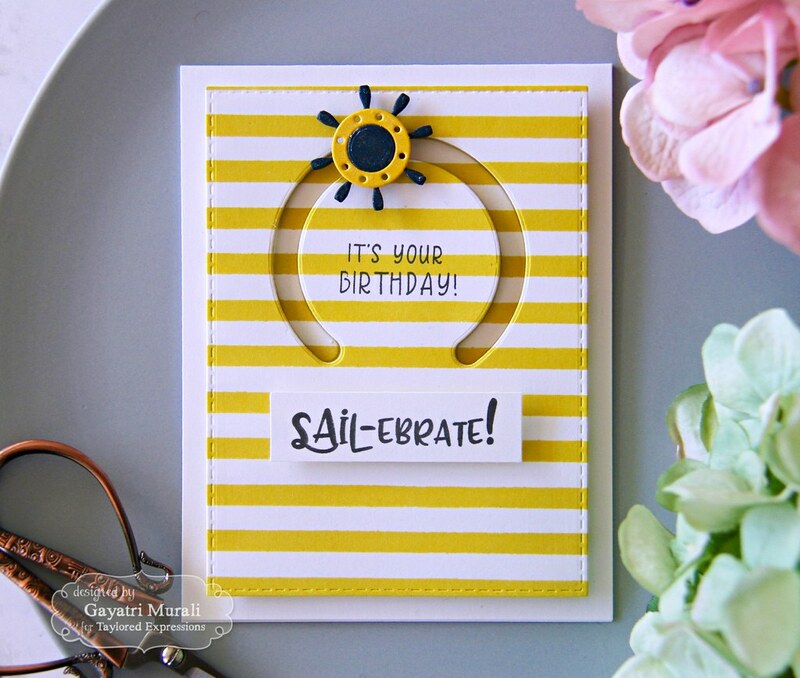 These are nautical themed die that coordinate with Sitting Pretty series. So they can be used to decorate a mantle using By the Fireside die or just a wall using Sitting Pretty and Sitting Pretty Accessories dies. 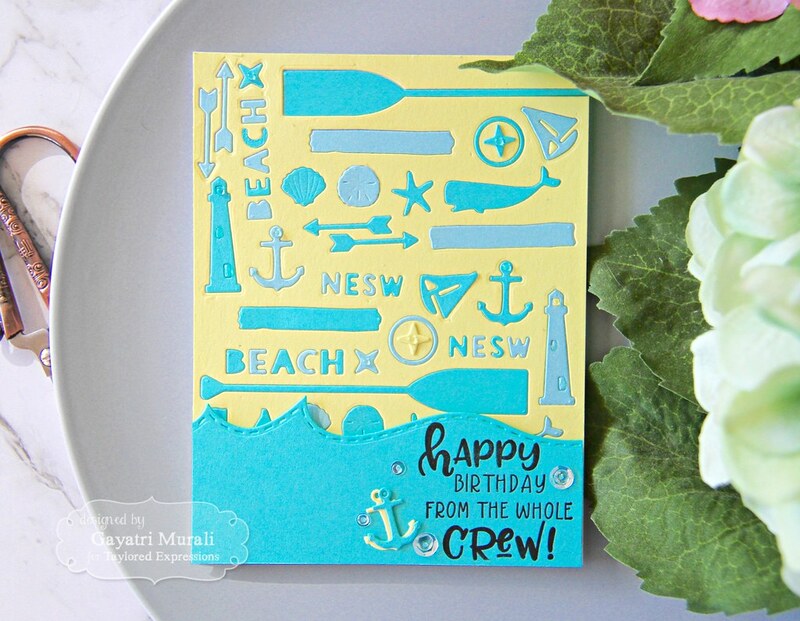 I just wanted to highlight the nautical dies and so I used them on their own to make my card. I die cut a PotatoChip panel using the dies randomly. I used the negative panel and kept the positive die cuts for use later. Then I also die cut two scrap piece of Cookie Monster and Sprinkles cardstock with the same dies. I adhered the negative Potato Chip panel on to a sticker sheet and inlaid the Cookie Monster and Spinkles die cuts into its places. I love the two shades of blue die cuts on the yellow cardstock panel. For the sentiment, I die cut a Cookie Monster cardstock using one of the Build a Scene: Rolling Waves die and stamped the sentiment from Seas the Day stamp set. I adhered this piece on the bottom of the card front using foam adhesives. I also embellished the sentiment panel with anchor die cuts, glossy accents and some sequins. Check out Taylored Expressions Blog for more inspirations from other designers. I will see you tomorrow for day #2 sneak peeks. Have a lovely day! the die cut card is fun. that is powered by motor. Mary, I am too afraid of water. Prefer a ship to a boat. Lol! I get sea sick very quickly. Thank you so much for your lovely comment. Love that die cut card in blue! Looks great! How cute are these? I LOVE the way you did the inlaid die cutting!! All those tiny images must have taken FOREVER!! Great design!